Machines Automation Robotic Systems identify the need, provide the solution, build it, test it, install it and train your people. We offer and deliver the complete package. We understand that in depth discussion is the first key step along the road to a successful engineering solution. The dialogue between you and our specialist team of design and manufacturing engineer's will ensure that all design objectives are identified and that all possible solutions are explored. 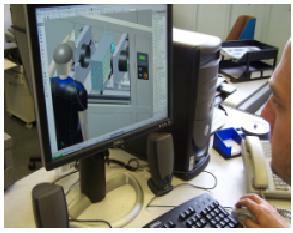 Detailed design work is undertaken in the Machines Automation Robotic Systems Networked Design Studio. We offer customers an extensive range of engineering solutions to meet their specific requirements, either newly designed via our multi station CAD centre or adapted from one of our proven design solutions already filed in our huge database library. We review all designs prior to manufacture. The fabrication, mechanical component manufacture, control assembly and final assembly then takes place. All machines undergo extensive production trials which includes rigorous machine safety and functionality testing on actual customer supplied samples. Our involvement doesn't end with the manufacture of the machine. We offer full training of your maintenance staff and operators either on site or at our own demonstration and training centre in York. If required, we will send our own installation team to commission the machines on site. We also offer continued support in the form of free telephone assistance during working hours, spares requirement, future modifications and overhaul of machines. Machines Automation Robotic Systems have BS/EN/ISO9001 certification and all machines supplied comply with the current CE and HSE requirements. Visit our sister sites Hot Plate Welding, Lidding Machines and Machines Automation Robotic Systems. © 2010-2016 MARS. Website by Resolve. Valid XHTML 1.0 Strict and CSS.